This book is an initiative by the Danish artists group: Superflex. Superflex has been working on a series of projects related to economic forces, democratic production conditions and Self-organisation since 1993. Most of their initiatives seem to question the existing economic structures. The initiatives aren’t necessarily opposed to the existing economical systems, but they do try to make people think of alternative options and other ways of structuring the world and its economics. Every Superflex initiative is presented as some form of art. Some of them, like their burning car movie clearly are artistic expressions. But some initiatives lean strongly towards developmental aid projects and need a thorough analysis before you get the artistic value. But all of the Superflex initiatives should be considered as tools. It are proposals that invite people to actively participate in and communicate the development of experimental models that alter the prevailing economic production conditions. So is this book. 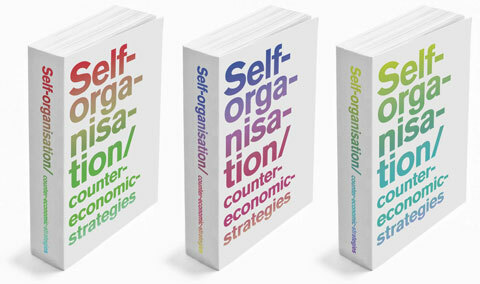 Self-organisation / Counter economic strategies is not very surprisingly a book about self-organisation and counter economic strategies. Self-organisation as put to use in this book is referring to an organisational system within groups that are independent of institutional or corporate structures, are non hierarchical, open and operate participatory decision-making processes. The counter economic strategies could be considered as alternatives to classical capitalist economic organisations that originate from existing economic systems. The book is a collection of ten different essays and a number of single examples of self- organisation and counter economic strategies. The essays are a collection made by Superflex, the writers of the essays aren’t necessarily a part of Superflex. The book is not about Superflex itself but “It is about the many approaches to the creation, dissemination and maintenance of alternative models for social and economic organisation, and the practical and theoretical implications, consequences and possibilities of these self-organised structures. The counter-economic strategies presented here are alternatives to classical capitalist economic organisation that exploit, or have been produced by, the existing global economic system” (superflex.net). This is a very good summary of the theme of the book. The essays have very different subjects, ranging from fan fiction to a philosophical approach, to self-organisation and the civil society, to the MST, an organisation in Brazil fighting for the rights of the land-less. But although the essays deal with very different subjects, they all give us a little insight in how the world could also be organised in the 21th century. This could be by analysing the acts of a civil society consisting of Brasilian farmers, or by means of discussing the consequences of digitalisation of information in our modern age. All essays try to make the reader think about alternatives. Also the number of examples of self- organisation and counter economic strategies anywhere in the book are very insightful and sometimes even helpful to link some of the information in the essays to real life. Some of the reserved examples are so original, I have to share them. First there is the Free Beer, an initiative where freedom of knowledge is put to a profitable use. Another one is Seastead, a project in which people are developing floating self-sufficent ocean cities. The last one I cannot keep to myself is an organisation called Raging Grannies. A collaboration of older women to get some public attention for issues they think are important. This book is a very interesting experience because it doesn’t only question the way societies are structured in the world today, but it actually shows some alternatives, which to me is very refreshing. The book can be considered an accusation to modern dominant social, political and economic systems, but then again it isn’t that critical. More in the line of the Superflex philosophy it’s a tool to make people think about alternatives. The book doesn’t really tell you what or who is good or bad. Although they clearly support the suppressed, but who doesn’t? I can’t blame them telling us some Cinderella stories come true from all over the world to show us that change in the way of thinking and structuring of society is actually possible. But besides the feeling of change this book is providing, I must admit being a bit sceptical. Although the book definitely shares some very interesting insights and success stories, it all seems to be a little small scaled. The book shows us the possibility of change but it definitely doesn’t show us a real change in the way people are thinking, only some changes on a very small scale. Also some of the essays dealing with the digital age and the revolutionary potential of digital information and the Internet seem to employ the utopian way of thinking which is so common in academic writing today. From my point of view this kind of writing could be considered as overly positive about the new opportunities of digitalisation. The book does actually show us some examples of how the possibilities of the Internet can be implemented to for instance close the information gap. The essay by Martha Wallner and Will Bradley called Independent media and self-organised culture in the US: Situations and strategies shows us a couple of self-organised media projects which use the Internet to make a change. But also in these examples it becomes evident everything is still very small scaled. For example, in most of the cases the initiatives are still struggling to finance their projects, which shows us it’s hard to make a successful change, even on the Internet. But then again, the book doesn’t want to tell us there is going to be a revolution of some sort. The book should be considered as a tool. It’s a proposal to reconsider the way we think about organising the society, on its social, political and economical level. To me the book is definitely interesting and insightful enough to make a person think about the alternatives and maybe even motivate to try and change things him- or herself.